Tag Archives for " Gourmia "
The Gourmia GFD1550 Food dehydrator is specifically designed to serve your need of having yummiest snacks loaded with health benefits. It is a great gift for anyone who likes to garden, hunt or wants to store foods for a long term. The Gourmia 1550 food dehydrator works wonderfully, it is easy to use and gives finest results. It offers 5 nesting trays for bulk dehydration that saves your valuable money and precious time. 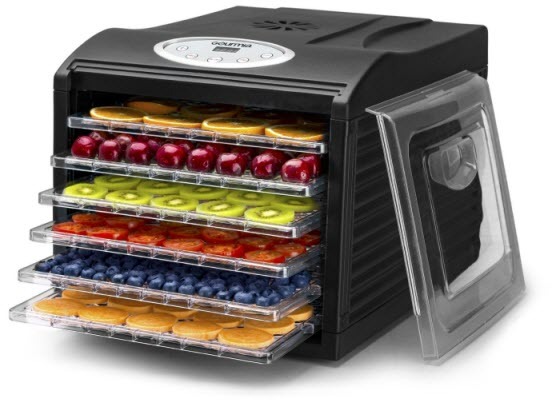 Instead of spending money on commercially dehydrated food, make your delicious jerky or fine fruit leather with this digital food dehydrator. Gourmia GFD1950 Digital Food Dehydrator is the latest food dryer from the famous manufacturing company “Gourmia." This food dehydrator provides the users an incredible experience of making some healthy delicious appetizers in the comfort of their kitchen. You can dry lots of foods in this machine like chips, herbs, fruit rolls, jerky, trail nut mixes, crackers granola, etc. If you are a person who loves to eat dehydrated treats such as, fruit rolls, home-made jerky, veggie chips, etc. but does not want to get indulged in some time taking process, then buying Gourmia GFD1950 Digital Food Dehydrator will be the perfection option. It comes with nine trays along with a fruit leather tray. ​Gourmia GFD1650 Premium Countertop Food Dehydrator is such a product, which is reliable, efficient and also price worthy. It is a budget, but neither too costly to make you suffocate nor too cheap to have the basic features only. If you are familiar with the basic operation of a food dehydrator, this gadget will allow you to do some advance operation with it.